Summer mineral sale in Kraissl Hall. Open to the public. 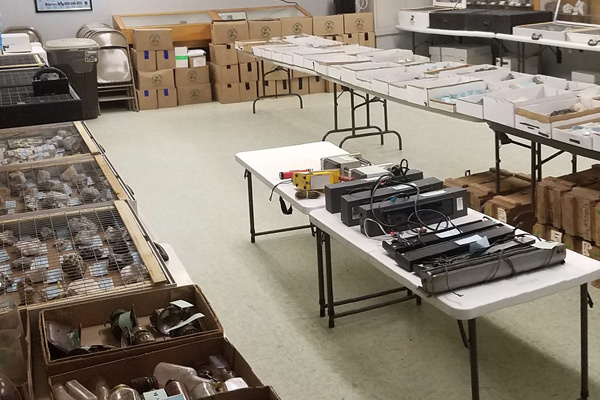 Both local (Franklin – Sterling Hill) and worldwide minerals will be available, along with miscellaneous mineral-related books, collecting equipment, mining memorabilia, etc. This year it is a little extra special. Like last year we have hundreds of world-wide minerals and fossils for sale. This year we are including hundreds of fluorescent minerals from around the world, including many spectacular Franklin and Sterling Hill fluorescent minerals! So it is a white-light and fluorescent light special summer season. Two fluorescent lights are available for use, but we highly recommend bringing your own. We have portable lights for sale in the gift shop available as well. There will be also many non-mineral items for sale too. The museum 10% discount will apply to ANY item at the sale, but you need to be a current member of the museum. We will start the sale July 7th, Saturday and it will be open at normal museum hours, 7 days a week for the entire summer season until September 7th.